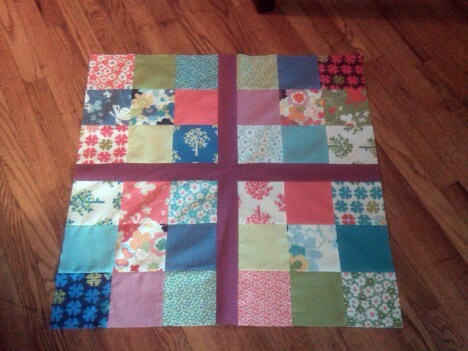 Quilting, quilting, quilting. On one hand, I like this part, because it’s really the point where you almost have a real finished project (pssh, who needs binding). On the other, my sewing machine doesn’t really like behaving when it comes to quilting—FMQ, at least. I can fiddle with my tension/needle and rethread the machine all I want sometimes and the tension just won’t be right, and then bam! it’ll magically start working again. So, walking foot it was. First I was ahead, now I’m behind. This weekend was quite unproductive, so I didn’t finish Friday’s assignment (the borders) until tonight. 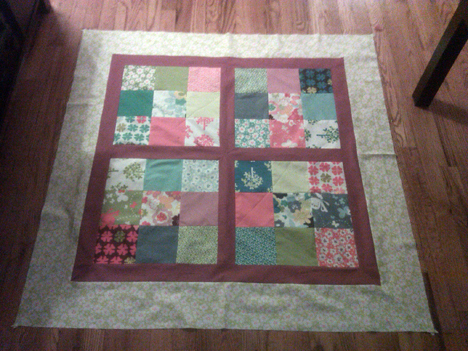 I’ll provide better photos (that are color correct) once I quilt it, promise! There’s nothing too interesting to talk about here… just your basic, mitered-cornered borders. I’m getting a bit ahead of schedule, but I just couldn’t stop myself from working on sashing when I got home from work yesterday. Remember, I decided to make a modification and add set-in seams to the center instead of doing butted sashing. Checkout the twist: there’s no right-side up (although it’s really only obvious in the photo if you look at the trees. I started early, because I had a feeling that the set-in seams would piss me off, requiring use of the seam ripper, and make me want to stop working (requiring more time so I could take a break for a day or so). But actually, it all went swimmingly. It’s not absolutely perfect—one seam ended up off by a little less than 1⁄8″ so there’s a really small gap in the center to cover with the quilting, but it is close enough for me. 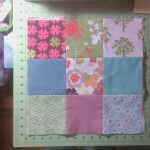 The assignment for day two of the Above All Fabric Spring Quilt-Along is to sew together the four nine-patch blocks out of charm squares. I’ll admit, I’ve been playing with the layout since I got my charm pack in the mail. I couldn’t help myself. Once I decided on my border, sashing, and bag fabrics, I chose to set aside those charms so that I could showcase as many of the collection’s prints as possible. 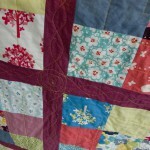 The Above All Fabric Spring Quilt-Along started yesterday. 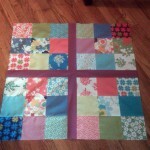 The assignment: cut out the sashing, border, and binding strips and work on arranging the charm squares. Before I can blog about progress on this, I have to tell you about my fabric choices, huh? I’m doing the quilt top entirely out of Just Wing It by MoMo for Moda. I played around with some other collections to go with the Just Wing It charm pack, but wasn’t feeling it. Remember, just last week, when I posted about all the projects I’m working on/thinking about working on? Okay, just checking. 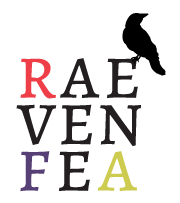 Now I’ve got it in my head to join in on a quilt-along hosted by Above All Fabric and Chris of Frecklemama. It starts on April 11, so I have two weeks to finish up the vest, make progress on the applique project and piece the damask quilt top. 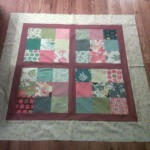 Oh, and do some cutting/quilting/piecing pre-work for a class I’m taking on April 12. I can do it, right? I was feeling very motivated this weekend. 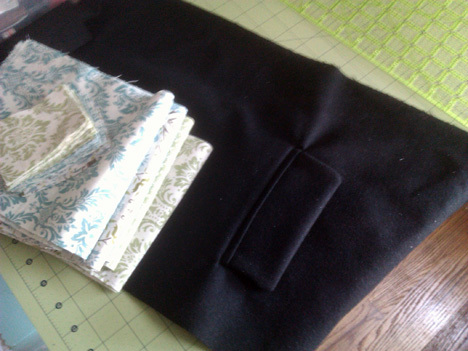 See, here is one of the welt pockets I made, and about 3⁄8ths of the pieces for the damask quilt. 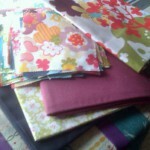 For the quilt-along fabrics, I ordered a charm pack of Just Wing It by MoMo for Moda. 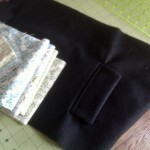 That‘s all I have so far, because I want to see the fabric before I decide on what should accompany it. Hopefully the yardage of the line will be available in time for me to make the bag. I also ordered some Kona Magenta because I think it might match, but if it doesn’t, I’ll use it along with the Tailor Made Teal Scissors and Multi Stitching Stripes fabric I picked up for that class I’m taking (we’re making a rotary mat and rulers bag and need 1 yd each of 3 fabrics). Speaking of Kona and my sanity, I really wanted to do this Modern Solids Quilt Along hosted by Patchwork Squared, but I’m not, because I need my sanity to deal with house training Moof, dealing with this non-Spring weather, trying to do Flamenco lessons and getting into shape for the start of the cycling season. And because there may soon be a Utica/Mohawk Valley MQG, so I need time for that. See? I’m not that busy. Right? Right??? Have you done/are you doing a quilt-along? Do you have any tips for keeping up to speed and being a good participant? Are you doing this one?